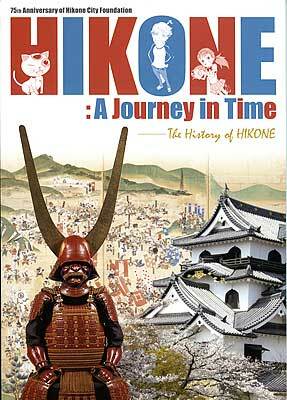 The Hikone Board of Education has published a manga comic booklet in English titled, Hikone: A Journey in Time. Targeting tourists, the black-and-white manga explains about Hikone’s feudal history and cultural sights through the eyes of John, a fictitious 20-year-old lad from Michigan (Shiga’s sister state) visiting Hikone while staying with a Japanese family. The A5-size, 70-page booklet is available for 500 yen at the Hikone Castle Museum next to the ticket booth where you enter Hikone Castle. The manga story starts off with John visiting Hikone Castle with his host family, the Tachibanas who have a 12-year-old daughter named Hana. A lightning bolt during a rainstorm transports John and Hana back in time to the year 1600 during the Battle of Sekigahara (in Gifu). A mysterious and beckoning cat named Toku serves as their time-warp tour guide as they witness the Eastern Forces’ Tokugawa Ieyasu defeat the Western Forces’ (and Shiga native) Ishida Mitsunari. Then they see Ieyasu’s major ally Ii Naomasa consequently awarded the domain of Hikone and his successors building Hikone Castle and the town. Ii Naosuke is also introduced as the Tairo (Chief Minister) of the Tokugawa government in 1858 who made the decision to open up Japan to the Western powers led by Commodore Perry (very good manga likeness). Naosuke is later assassinated by radical samurai from Mito in 1860 while on his snowy way to Edo Castle’s Sakurada-mon Gate. Although the manga shows him being shot and stabbed in his palanquin, it does not show (nor mention) that he was also dragged out of his palanquin and beheaded. Toku the talking cat then takes John and Hana to see Hikone’s cultural products like kotoyaki pottery and Takamiya jofu textiles and Korean emissary processions. John and Hana are later zapped back to the present day as the cat disappears. The manga continues with the legendary story of the maneki-neko or beckoning cat saving Ii Naotaka (3rd lord of Hikone) from a lightning bolt at Gotokuji temple in Tokyo. John also visits a butsudan Buddhist altar factory where Hana’s dad works. I wish they also mentioned that many of the butsudan parts are crafted elsewhere (such as in neighboring Maibara) and then assembled in Hikone. The end of the book has short English articles about the Korean Road (along which the Korean emissary traveled in Hikone on the way to Edo), Hikone Castle being on the World Heritage Site Tentative List, Hiko-nyan (Hikone’s official mascot), and a list and map of cultural properties in Hikone. It doesn’t elaborate on Hikone Castle’s prospects of actually becoming a World Heritage Site which I think is a long shot. It has languished on the Tentative List for 20 years since Japan first nominated it in 1992. The manga is apparently part of a strategy to gain support for Hikone Castle’s designation as a World Heritage Site. Actually, I think they should first push Lake Biwa‘s designation as a national park (it’s a quasi-national park). It’s one of the world’s oldest lakes with unique native species and has a long satoyama history of people living and interacting with the lake. And besides Hikone Castle, there are numerous nationally historic, cultural, and scenic sites around the lake such Mt. Shizugatake, Anegawa River, Mt. Ibuki, Nagahama Castle, Lake Yogo, Azuchi Castle, and Harie. The manga provides whirlwind/superficial coverage of Hikone’s history, so some important details are missing. But it does give the newcomer a good, if not amusing, idea of what Hikone is about. 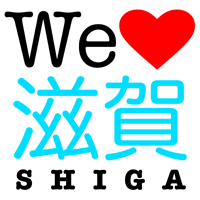 It’s good enough for me to buy a copy to give to friends visiting Shiga. The booklet is an excellent attempt by a local Board of Education to reach out to foreign tourists, a very rare project indeed. All local Boards of Education should follow suit. After all, they are the ones who have the expertise in local history and culture. The tourist bureaus are not terribly interested in explaining about local culture and history (because they are not academics nor researchers) and don’t care so much about serving a minority (foreign) segment of visitors. When they do produce something in English, it’s usually pretty shoddy. The Hikone Board of Education contracted Kyoto Seika University to produce the booklet. The manga was drawn by a graduate of the university, Kojima Eiyu (小島瑛由). He did a fine job. The English translation was done by a manga researcher at Kyoto Seika University International, Jessica Bauwens-Sugimoto, and the editing was supervised by Peter J. Morris, Executive Director of International Programs at the University of Shiga Prefecture (not to be confused with Shiga University, a national university). Employing native English speakers was wise (compared to using machine translation or a Japanese translator), but the booklet still has too many typos and grammatical issues. Apparently, the translator and editor weren’t given a chance to proofread their work. Many Japanese in printing/publishing don’t understand that translators/writers need time to proofread their work. I bet it was a rush job and the translator had only the Japanese text to translate, without the benefit of seeing the manga cells. It’s like translating a photo caption without seeing the photo. It’s very difficult. The translator/editor should also be given adequate leeway to modify the English text/dialog to suit the foreign readership and convey the meaning accurately. Some 3,000 copies have been printed for the first printing. According to the Shiga Hikone Shimbun, the production cost was 2.6 million yen (867 yen per copy) which means they are taking a substantial loss by selling it for so cheap at 500 yen. The BOE published it to mark the 75th anniversary of Hikone. For more information, call the Hikone Board of Education at 0749-26-5833. On the booklet’s cover, instead of touristy photographs, why not have a large manga in color to indicate that it’s a manga booklet? It would be more eye-catching. John’s dad is Japanese and mom is American. But the story does not play up this tidbit at all. His parents don’t say anything and we can only question his nationality. The word “cool” is used too often. The asterisk used to cite Japanese terms should appear at the end of the word, not above it. “City” need not be appended to “Hikone.” It’s not part of the city’s name (like Kansas City or New York City). Appending “city” would be necessary only if the name of the city is the same as the prefecture, such as Hiroshima, to prevent confusion. I also recommend teaching how to pronounce “Hikone.” Most Americans might pronounce it Hee-cone with a silent e.
Page 10 does not say where Uoya-machi is and its relation to the castle. Page 11 should mention that the Horse Stable and Tenbin Yagura are Important Cultural Properties. Too bad there’s no illustration of the Horse Stable’s interior. No mention of the Nishinomaru 3-story turret which is also an Important Cultural Property. It doesn’t show the exhibits inside Hikone Castle Museum. Should mention that the castle is a short walk from Hikone Station. Page 14 says that you can walk around the outside balcony. This seems to be a mistranslation. It’s not about walking around the outside balcony (which we cannot do since the balcony is too small), it’s about the cornice-like balcony that goes around the tower. Also on the same page, “one can only climb up 1 or 2 meters” needs to be clarified/explained further. The use of capital letters is inconsistent: For example, Hikone Castle and Hikone castle. Page 16 should mention the other three castles (Matsumoto, Inuyama, and Himeji) which are also National Treasures. Page 19 should caption the statue of Ii Naosuke. 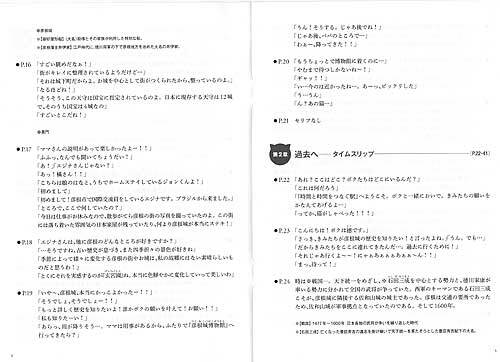 Page 24 has “…East and West. Led by Ishida Mitsunari and Tokugawa Ieyasu.” This makes it look like Mitsunari led the East and Ieyasu the West. It should be vice versa. Page 25 should mention where Sekigahara is. And that the battle sites can be easily visited from Sekigahara Station, not far from Hikone. Page 36 shows Naosuke’s entourage leaving his residence near Edo Castle (or perhaps entering Sakurada-mon Gate). However, the text says that he met trouble as he was entering Sakurada-mon Gate. This implies that he was assassinated at or inside the gate or castle grounds. Not so. He was attacked soon after leaving his residence and well before they reached Sakurada-mon Gate. The practice of breaking up a sentence into two (or more) speech bubbles doesn’t bode well in English. 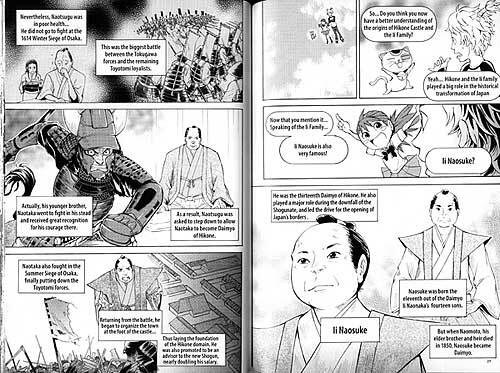 Page 42 should explain the Noh illustrations. 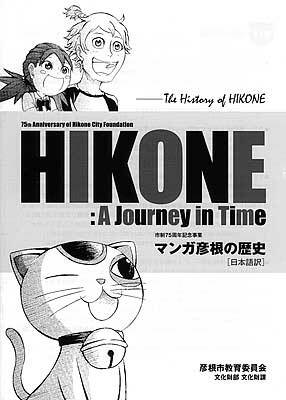 “Hikonyan” should be spelled “Hiko-nyan.” Otherwise, people are apt to mispronounce it as “Hikon-yan,” for example. Update (Feb. 9, 2014): A Japanese version of this English manga has been published in Jan. 2014. It is selling for 500 yen. As of Jan. 2014, about 1,500 copies of the English version has been sold. Sample manga page from Hikone: A Journey in Time.